From Goodreads ~ You know Judy Greer, right? Maybe from "The Wedding Planner", "13 Going on 30", "Carrie", "Arrested Development" or "The Descendants". Yes, you totally recognize her. And, odds are, you already feel like she’s your friend. 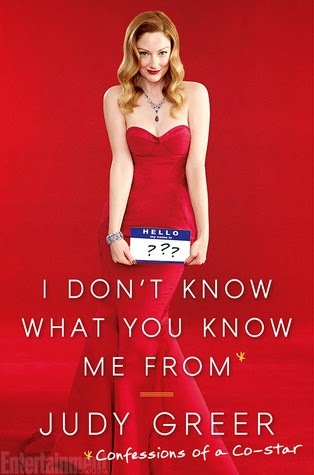 In her first book of essays, "I Don’t Know What You Know Me From", Greer writes about everything you would hope to hear from your best friend: how a midnight shopping trip to Walgreens can cure all; what it’s like to wake up one day with stepchildren; and how she really feels about fans telling her that she’s prettier in person. Yes, it’s all here - from the hilarious moments to the intimate confessions. But Judy Greer isn’t just a regular friend - she’s a celebrity friend. Want to know which celebs she’s peed next to? Or what the Academy Awards are actually like? Or which hot actor gave her father a Harley-Davidson? Don’t worry, Greer reveals all of that, too. You’ll love her because, besides being laugh-out-loud funny, she makes us genuinely feel like she’s one of us. Because even though she sometimes has a stylist and a makeup artist, she still wears (and hates!) Spanx. Because even after almost twenty years in Hollywood, she still hasn’t figured everything out - except that you should always wash your face before bed. Always. Judy Greer has been an actress for about 20 years and has 90+ credits to her name. You probably recognize her from her roles as best friends and/or supporting characters. Part 1 - Early life: her mom, the pink car her parents bought her, her jobs in high school and university, her trip to Spain, etc. Part 2 - Hollywood: choosing her stage name, celebrities she has peed next to, attending an Oscar party (her dress falling apart was just the start of the night), a famous actor giving her dad a Harley, etc. Part 3 - Real life: meeting her husband, becoming a stepmom, etc. I liked this book and thought it was a fun read. I liked the writing style (it was amusing and honest) and found most of the essays funny and/or entertaining ... like when she got her dog or went on the first date with her now-husband. She seems down to earth and I bet she would be fun to hang and have a glass (or two) of wine with. If you'd like to get a behind-the-scenes view of being a working actress, you should check it out. As a head's up, there is swearing.